Take a break from holiday shopping and enjoy the spirit of the season with Five Rivers MetroParks’ holiday events. Whether you step back in time to enjoy Christmas traditions of the 1880s or take a peaceful stroll along an illuminated path at Aullwood Garden MetroPark, there are opportunities for people of all ages to get outside and create new holiday traditions. December kicks off with Christmas on the Farm at Carriage Hill MetroPark where families can experience what Christmas was like in the 1880s. Christmas on the Farm is Sunday, December 2nd, Noon to 4pm. Why it’s a holiday must: The combination of history and hands-on activities provide guests with a unique holiday experience. Visitors enjoy timeless Christmas traditions, while learning and having fun with their families. For the kids: From historical demonstrations of crafts to music and ornament making, there are myriad engrossing activities for kids of all ages. Families also can help decorate the farm house, and then enjoy a holiday bonfire. 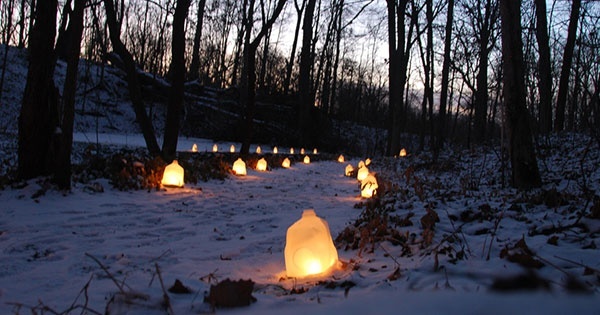 After Christmas on the Farm, visit Aullwood Garden MetroPark for its annual Winter Luminary Walk. Dress for the weather and enjoy a quiet stroll along the beautifully lit pathways that lead to the Aull house. Aullwood Winter Luminary Walk is Sunday, December 2nd, 6pm to 8pm. Why it’s a holiday must: The combination of festive lights, outdoor winter fun and local history make this a special holiday tradition for people of all ages. The luminary walk culminates with a visit to the Aull house. Dating back to 1907, this rustic Arts and Crafts-style house will be filled with refreshments, simple decorations and historical charm. Guests will also have a chance to learn about the Aulls and their home, which is on the Ohio State and National Historic Registries. For the kids: Not only will children love some time outdoors along Aullwood Garden MetroPark’s illuminated paths, they will get a chance to meet the jolly man himself! Santa will be passing out candy canes and taking Christmas requests from everyone on his list. Bring your camera for your child’s Santa photo op, and then enjoy hot chocolate and cookies while you explore the Aull house. How to go: Aullwood Garden MetroPark is located at 955 Aullwood Rd. in Englewood. Park in the lot adjacent to the Stillwater River. Rangers and volunteers will be available to help you find your way to the path and Aull house. The Aullwood Winter Luminary Walk is free. Spend a chilly winter evening by the warmth of a bonfire as you experience seasonal history come to life. Families can interact with living historians and watch demonstrations, all by the light of candles and luminaries throughout the Carriage Hill Historical Farm. Holiday Evening at Carriage Hill - Saturday, December 8th, 6pm to 8:30pm. Why it’s a holiday must: An immersive experience for people of all ages, Holiday Evening at Carriage Hill breathes life into Victorian-era holiday traditions. Families can experience what the holidays were like on a working farm more than 100 years ago. For the kids: Curious kiddos have an opportunity to ask living historians questions while they watch period demonstrations. Walk through the 1880s farmhouse to see sweets being made, visit the barn animals, and then finish the evening by watching blacksmith and woodshop demonstrations.